Sarah L. Ireland, 95, of Cape Girardeau died Thurs., Nov. 10, 2005, at her home. She was born Jan. 26, 1910, in Greenbrier, Mo., to the late Sanford and Rhoda Barrett Cato. She married Ward N. Ireland Sr. on July 3, 1941, in Cape Girardeau. He died Dec. 19, 1966. Since 1977, Ireland was a member of the Bethel Assembly of God Church in Cape Girardeau. Before joining that church she was an active member of Lutesville Assembly of God Church. Survivors include a son, Ward N. Ireland Jr., of Jackson; a daughter, Helen Ireland of Cape Girardeau; five grandchildren; and three great-grandchildren. 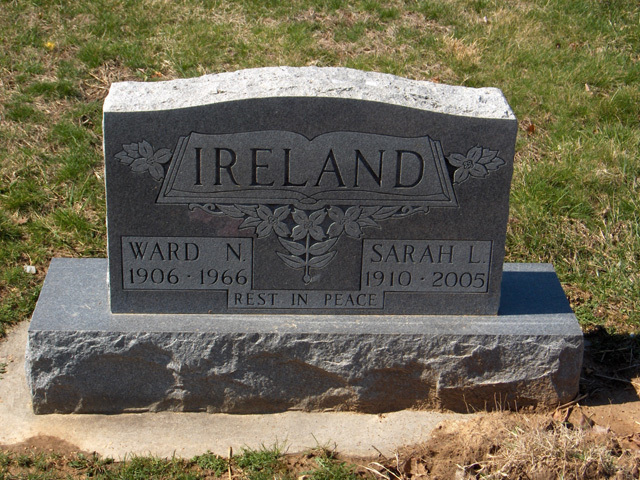 Ireland was preceded in death by six brothers and five sisters. Friends may call from 4 to 8 p.m. today at McCombs Funeral Home in Cape Girardeau. The funeral will be at 1 p.m. Sunday, at the funeral home, with the Rev. Phil Roop officiating. Burial will be in Bollinger County Memorial Park Cemetery in Marble Hill, Mo.